The present invention relates to a solid detergent composition comprising: (a) detersive surfactant; (b) lipase of bacterial origin; (c) from 0wt% to less than 10wt% zeolite builder; (d) from 0wt% to less than 10% phosphate builder; (e) optionally, from 0wt% to less than 10wt% silicate; and (f) optionally pefume; and (g) optionally, additional detergent ingredients. The present invention relates to solid detergent compositions comprising lipase of bacterial origin. Recent solid laundry detergent consumer preferences towards smaller more concentrated product forms, colder wash temperatures and shorter wash times have resulted in the solid detergent formulators handling a whole series of different constraints. In addition, not only do consumers want smaller compacted solid laundry detergent products to use at these lower wash temperatures and shorter wash times, but the consumers also want these compacted products to have the same performance as traditional uncompacted solid laundry detergents have at higher wash temperatures and during longer wash cycles; this is an extremely difficult consumer need to meet. Compacted solid laundry detergent products have less space to incorporate detergent ingredients; this places great constraint on the detergent formulator, especially for restricting the levels of the bulk detergent ingredients like surfactants, builders and solvents that take up much of the formulation space. For the detergent ingredients that are incorporated into these compacted solid laundry detergent products, the detergent formulator must greatly improve the efficiency of these detergent ingredients, and of the compacted solid laundry detergent composition as a whole. It is important to maintain good cleaning performance, especially greasy cleaning performance, good odor profile, and good product stability as one compacts the solid laundry detergent composition. The present invention provides a solid laundry detergent composition comprising specific lipases of bacterial origin. Solid laundry detergent composition. The solid laundry detergent composition typically comprises: (a) detersive surfactant; (b) lipase of bacterial origin; (c) from 0wt% to less than 5wt% zeolite builder; (d) from 0wt% to less than 5wt% phosphate builder; (e) optionally, from 0wt% to less than 10wt% silicate salt; and (f) optionally, additional detergent ingredients.. The composition can be any suitable form, including free-flowing particulate form, or a unit dose form including tablet form, detergent sheet form. The composition may in the form of a pouch, for example the particles or tablet may be at least partially, preferably completely, enclosed by a film, preferably a water-soluble and/or water-dispersible film. A preferred film is a polyvinyl alcohol film. Highly preferably, the composition is a laundry detergent composition. flocculant particles such as polyethylene oxide particles, wax particles such as wax agglomerates, brightener particles, dye transfer inhibition particles; dye fixative particles, perfume particles such as perfume microcapsules and starch encapsulated perfume accord particles, or pro-perfume particles such as Schiff base reaction product particles, bleach activator particles such as oxybenzene sulphonate bleach activator particles and tetra acetyl ethylene diamine bleach activator particles; hueing dye particles; chelant particles such as chelant agglomerates; and any combination thereof. Detersive surfactant. Suitable detersive surfactants include anionic detersive surfactants, non-ionic detersive surfactant, cationic detersive surfactants, zwitterionic detersive surfactants and amphoteric detersive surfactants. Preferred anionic detersive surfactants include sulphate and sulphonate detersive surfactants. suitable LAB includes low 2-phenyl LAB, such as those supplied by Sasol under the tradename Isochem® or those supplied by Petresa under the tradename Petrelab®, other suitable LAB include high 2-phenyl LAB, such as those supplied by Sasol under the tradename Hyblene®. A suitable anionic detersive surfactant is alkyl benzene sulphonate that is obtained by DETAL catalyzed process, although other synthesis routes, such as HF, may also be suitable. Preferred sulphate detersive surfactants include alkyl sulphate, preferably C8-i8 alkyl sulphate, or predominantly C12 alkyl sulphate. Another preferred sulphate detersive surfactant is alkyl alkoxylated sulphate, preferably alkyl ethoxylated sulphate, preferably a C8-18 alkyl alkoxylated sulphate, preferably a C8-18 alkyl ethoxylated sulphate, preferably the alkyl alkoxylated sulphate has an average degree of alkoxylation of from 1 to 20, preferably from 1 to 10, preferably the alkyl alkoxylated sulphate is a C8-18 alkyl ethoxylated sulphate having an average degree of ethoxylation of from 1 to 10, preferably from 1 to 7, more preferably from 1 to 5 and most preferably from 1 to 3. The alkyl sulphate, alkyl alkoxylated sulphate and alkyl benzene sulphonates may be linear or branched, substituted or un-substituted. The detersive surfactant may be a mid-chain branched detersive surfactant, preferably a mid-chain branched anionic detersive surfactant, more preferably a mid-chain branched alkyl sulphate and/or a mid-chain branched alkyl benzene sulphonate, most preferably a mid-chain branched alkyl sulphate. Preferably, the mid-chain branches are C1-4 alkyl groups, preferably methyl and/or ethyl groups. Suitable non-ionic detersive surfactants are selected from the group consisting of: C8-C18 alkyl ethoxylates, such as, NEODOL® non-ionic surfactants from Shell; C6-C12 alkyl phenol alkoxylates wherein preferably the alkoxylate units are ethyleneoxy units, propyleneoxy units or a mixture thereof; C12-C18 alcohol and C6-C12 alkyl phenol condensates with ethylene oxide/propylene oxide block polymers such as Pluronic® from BASF; C14-C22 mid-chain branched alcohols; C14-C22 mid-chain branched alkyl alkoxylates, preferably having an average degree of alkoxylation of from 1 to 30; alkylpolysaccharides, preferably alkylpolyglycosides; polyhydroxy fatty acid amides; ether capped poly(oxyalkylated) alcohol surfactants; and mixtures thereof. Preferred non-ionic detersive surfactants are alkyl polyglucoside and/or an alkyl alkoxylated alcohol. Preferred non-ionic detersive surfactants include alkyl alkoxylated alcohols, preferably C8- 18 alkyl alkoxylated alcohol, preferably a C8-18 alkyl ethoxylated alcohol, preferably the alkyl alkoxylated alcohol has an average degree of alkoxylation of from 1 to 50, preferably from 1 to 30, or from 1 to 20, or from 1 to 10, preferably the alkyl alkoxylated alcohol is a C8-18 alkyl ethoxylated alcohol having an average degree of ethoxylation of from 1 to 10, preferably from 1 to 7, more preferably from 1 to 5 and most preferably from 3 to 7. The alkyl alkoxylated alcohol can be linear or branched, and substituted or un-substituted. wherein n is the average degree of alkoxylation and is in the range of from 4 to 10. Suitable cationic detersive surfactants include alkyl pyridinium compounds, alkyl quaternary ammonium compounds, alkyl quaternary phosphonium compounds, alkyl ternary sulphonium compounds, and mixtures thereof. (R)(Ri)(R2)(R3)N+ X- wherein, R is a linear or branched, substituted or unsubstituted C6-18 alkyl or alkenyl moiety, Ri and R2 are independently selected from methyl or ethyl moieties, R3 is a hydroxyl, hydroxymethyl or a hydroxyethyl moiety, X is an anion which provides charge neutrality, preferred anions include: halides, preferably chloride; sulphate; and sulphonate. Preferred cationic detersive surfactants are mono- C6-18 alkyl mono-hydroxyethyl di-methyl quaternary ammonium chlorides. Highly preferred cationic detersive surfactants are mono-C8-10 alkyl mono- hydroxyethyl di-methyl quaternary ammonium chloride, mono-C1o-12 alkyl mono-hydroxyethyl di-methyl quaternary ammonium chloride and mono-C1o alkyl mono-hydroxyethyl di-methyl quaternary ammonium chloride. Zeolite builder. The composition comprises from 0wt% to 10wt% zeolite builder, preferably to 7wt%, or to 4wt%, or to 3wt%, or to 2wt%, or even to lwt% zeolite builder. The composition may even be substantially free of zeolite builder; substantially free means "no deliberately added". Typical zeolite builders include zeolite A, zeolite P and zeolite MAP. Phosphate builder. The composition comprises from 0wt% to 10wt% phosphate builder, preferably to 7wt%, or to 4wt%, or to 3wt%, or to 2wt%, or even to lwt% phosphate builder. The composition may even be substantially free of phosphate builder; substantially free means "no deliberately added". A typical phosphate builder is sodium tri-polyphosphate. Silicate salt. The composition may preferably comprise from 0wt% to less than 10wt% silicate salt, preferably to 9wt%, or to 8wt%, or to 7wt%, or to 6wt%, or to 5wt%, or to 4wt%, or to 3wt%, or even to 2wt%, and preferably from above 0wt%, or from 0.5wt%, or even from lwt% silicate salt. A preferred silicate salt is sodium silicate. Carbonate salt. A suitable carbonate salt is sodium carbonate and/or sodium bicarbonate. Preferably, the composition comprises a bicarbonate salt. It may be preferred for the composition to comprise low levels of carbonate salt, for example, it may be preferred for the composition to comprise from 0wt% to 10wt% carbonate salt, preferably to 8wt%, or to 6wt%, or to 4wt%, or to 3wt%, or to 2wt%, or even to lwt% carbonate salt. The composition may even be substantially free of carbonate salt; substantially free means "no deliberately added". Bleach. The composition preferably comprises bleach, preferably from 0wt% to 10wt% bleach. 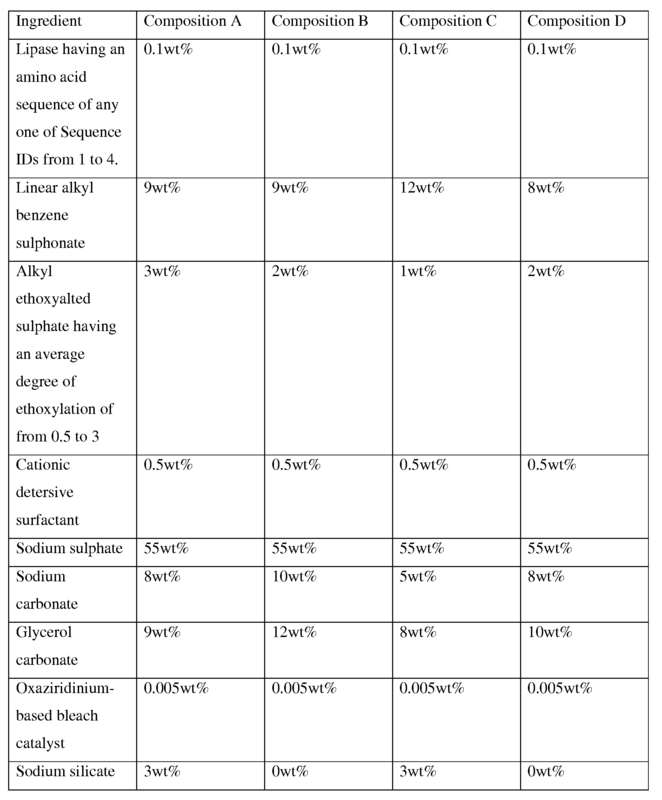 wherein the composition comprises from 0wt% to 10wt% bleach, preferably to 9wt%, or to 8wt%, or to 7wt%, or to 6wt%, or to 5wt%, or to 4wt%, or to 3wt%, or even to 2wt%, and preferably from above 0wt%, or from 0.5wt%, or even from lwt% bleach. Suitable bleach includes a source of hydrogen peroxide, typically in combination with a bleach activator and/or a bleach catalyst. Preferred source of hydrogen peroxide includes percarbonate and/or perborate salts, more preferably sodium percarbonate, sodium perborate monohydrate, and/or sodium perborate tetrahydrate. Preferably, the source of hydrogen peroxide, especially percarbonate salt, is coated. Preferred coating materials are carbonate salts, sulphate salts, silicate salts including borosilicate salts, and mixtures thereof. Another suitable source of hydrogen peroxide is pre-formed peracid. 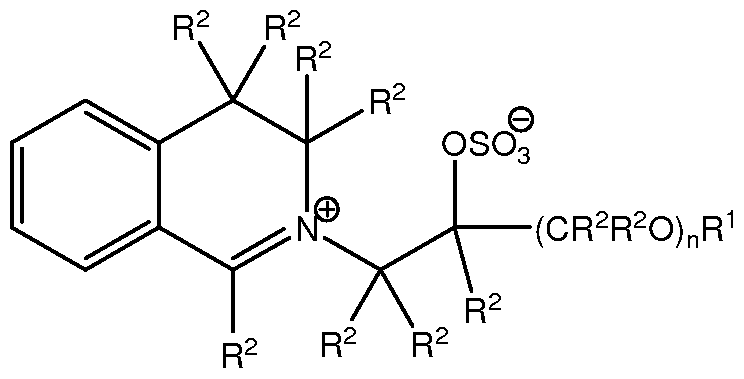 Preferably the pre-formed peracid is coated or encapsulated. Preferred bleach activators include: tetraacetylthylene diamine (TAED); oxybenzene sulphonate (OBS) preferably nonanoyl oxybenzene sulphonate; nitrile quats, and mixtures thereof. Preferred bleach catalysts include: imine bleach boosters, preferably oxaziridinium bleach boosters; transition metal catalysts, bleaching enzymes; and mixtures thereof. Bleach particle. Preferably, the composition comprises bleach activator, such as tetra- ethylene diamine (TAED) and a source of hydrogen peroxide, such as sodium percarbonate. Preferably, the source of hydrogen peroxide, preferably the sodium percarbonate is in the form of a co-particle that additionally comprises a bleach activator, preferably tetra-ethylene diamine (TAED). It is highly preferred for a large amount of bleach activator relative to the source of hydrogen peroxide to be present in the laundry detergent composition. Preferably, the weight ratio of bleach activator to source of hydrogen peroxide present in the laundry detergent composition is at least 0.5:1, at least 0.6:1, at least 0.7: 1, 0.8:1, preferably at least 0.9:1, or 1.0:1.0, or even 1.2: 1 or higher. Preferably, the composition comprises a bleach particle, wherein the bleach particle comprises: (i) bleach activator, preferably TAED; and (ii) a source of hydrogen peroxide, preferably sodium percarbonate. Highly preferably, the bleach activator at least partially, preferably completely, encloses the source of hydrogen peroxide. Bleach catalyst. Preferably the composition comprises bleach catalyst. Preferred bleach catalysts include oxaziridinium-based bleach catalysts, transition metal bleach catalysts, bleaching enzymes, and any combination thereof. wherein: R1 is selected from the group consisting of: H, a branched alkyl group containing from 3 to 24 carbons, and a linear alkyl group containing from 1 to 24 carbons; preferably, R1 is a branched alkyl group comprising from 6 to 18 carbons, or a linear alkyl group comprising from 5 to 18 carbons, more preferably each R1 is selected from the group consisting of: 2-propylheptyl, 2-butyloctyl, 2-pentylnonyl, 2-hexyldecyl, n-hexyl, n-octyl, n-decyl, n-dodecyl, n-tetradecyl, n- hexadecyl, n-octadecyl, iso-nonyl, iso-decyl, iso-tridecyl and iso-pentadecyl; R2 is independently selected from the group consisting of: H, a branched alkyl group comprising from 3 to 12 carbons, and a linear alkyl group comprising from 1 to 12 carbons; preferably R2 is independently selected from H and methyl groups; and n is an integer from 0 to 1. Hueing agent. Hueing dyes are formulated to deposit onto fabrics from the wash liquor so as to improve fabric whiteness perception. Preferably the hueing agent dye is blue or violet. It is preferred that the shading dye(s) have a peak absorption wavelength of from 550nm to 650nm, preferably from 570nm to 630nm. A combination of dyes which together have the visual effect on the human eye as a single dye having a peak absorption wavelength on polyester of from 550nm to 650nm, preferably from 570nm to 630nm. This may be provided for example by mixing a red and green-blue dye to yield a blue or violet shade. Dyes are coloured organic molecules which are soluble in aqueous media that contain surfactants. Dyes are described in 'Industrial Dyes', Wiley VCH 2002, K .Hunger (editor). Dyes are listed in the Color Index International published by Society of Dyers and Colourists and the American Association of Textile Chemists and Colorists. Dyes are preferably selected from the classes of basic, acid, hydrophobic, direct and polymeric dyes, and dye-conjugates. Those skilled in the art of detergent formulation are able to select suitable hueing dyes from these publications. Polymeric hueing dyes are commercially available, for example from Milliken, Spartanburg, South Carolina, USA. Examples of suitable dyes are direct violet 7 , direct violet 9 , direct violet 11 , direct violet 26, direct violet 31, direct violet 35, direct violet 40, direct violet 41, direct violet 51, direct violet 66, direct violet 99, acid violet 50, acid blue 9, acid violet 17, acid black 1 , acid red 17, acid blue 29, solvent violet 13, disperse violet 27 disperse violet 26, disperse violet 28, disperse violet 63 and disperse violet 77, basic blue 16, basic blue 65, basic blue 66, basic blue 67, basic blue 71, basic blue 159, basic violet 19, basic violet 35, basic violet 38, basic violet 48; basic blue 3 , basic blue 75, basic blue 95, basic blue 122, basic blue 124, basic blue 141, thiazolium dyes, reactive blue 19, reactive blue 163, reactive blue 182, reactive blue 96, Liquitint® Violet CT (Milliken, Spartanburg, USA) and Azo-CM-Cellulose (Megazyme, Bray, Republic of Ireland). Lipase of bacterial origin. The composition comprises a lipase of bacterial origin. Preferred lipases are selected from: (a) lipase having at least 60%, preferably at least 65%, or at least 70%, or at least 75%, or at least 80%, or at least 85%, or at least 90%, or at least 95%, or at least 99% identity with Srill; (b) lipase having at least 60%, preferably at least 65%, or at least 70%, or at least 75%, or at least 80%, or at least 85%, or at least 90%, or at least 95%, or at least 99% identity with ScoIIA; (c) lipase having at least 60%, preferably at least 65%, or at least 70%, or at least 75%, or at least 80%, or at least 85%, or at least 90%, or at least 95%, or at least 99% identity with ScoIIB; and (d) lipase having at least 60%, preferably at least 65%, or at least 70%, or at least 75%, or at least 80%, or at least 85%, or at least 90%, or at least 95%, or at least 99% identity with Cefll. Srill is from Streptomyces rimosus, its sequence is shown in sequence ID 1. ScoIIA is from Streptomyces coelicolor, its sequence its shown in sequence ID 2. ScoIB is also from Streptomyces coelicolor, its sequence is shown in sequence ID 3. Cefll is from Corynebacterium efficiens, its sequence is shown in sequence ID 4. Other lipase. In addition to the specific lipase of bacterial origin described above, the composition may comprise other lipases. Suitable lipases include those of bacterial or fungal origin. Chemically modified or protein engineered mutants are included. Examples of useful lipases include lipases from Humicola (synonym Thermomyces), e.g., from H. lanuginosa (T. lanuginosus) as described in EP 258 068 and EP 305 216 or from H. insolens as described in WO 96/13580, a Pseudomonas lipase, e.g., from P. alcaligenes or P. pseudoalcaligenes (EP 218 272), P. cepacia (EP 331 376), P. stutzeri (GB 1,372,034), P. fluorescens, Pseudomonas sp. strain SD 705 (WO 95/06720 and WO 96/27002), P. wisconsinensis (WO 96/12012), a Bacillus lipase, e.g., from B. subtilis (Dartois et al. (1993), Biochemica et Biophysica Acta, 1131, 253-360), B. stearothermophilus (JP 64/744992) or B. pumilus (WO 91/16422). Lipoclean® by Novozymes, Bagsvaerd, Denmark. Preferably, the composition comprises a variant of Thermomyces lanuginosa lipase having >90% identity with the wild type amino acid and comprising substitution(s) at T231 and/or N233, preferably T231R and/or N233R. (a) subtilisins (EC 3.4.21.62), including those derived from Bacillus, such as Bacillus lentus, B. alkalophilus, B. subtilis, B. amyloliquefaciens, Bacillus pumilus and Bacillus gibsonii described in US 6,312,936, US 5,679,630, US 4,760,025, US 7,262,042 and WO09/021867. (b) trypsin-type or chymotrypsin-type proteases, such as trypsin (e.g., of porcine or bovine origin), including the Fusarium protease described in WO 89/06270 and the chymotrypsin proteases derived from Cellumonas described in WO 05/052161 and WO 05/052146. (c) metalloproteases, including those derived from Bacillus amyloliquefaciens described in WO 07/044993. Excellase® and Purafect OXP® by Genencor International, those sold under the tradename Opticlean® and Optimase® by Solvay Enzymes, those available from Henkel/ Kemira, namely BLAP (sequence shown in Figure 29 of US 5,352,604 with the folowing mutations S99D + SlOl R + S103A + V104I + G159S, hereinafter referred to as BLAP), BLAP R (BLAP with S3T + V4I + V199M + V205I + L217D), BLAP X (BLAP with S3T + V4I + V205I) and BLAP F49 (BLAP with S3T + V4I + A194P + V199M + V205I + L217D) - all from Henkel/Kemira; and KAP (Bacillus alkalophilus subtilisin with mutations A230V + S256G + S259N) from Kao. Preferably, the composition comprises a subtilisin protease selected from BLAP, BLAP R, BLAP X or BLAP F49. Cellulase. Suitable cellulases include those of bacterial or fungal origin. Chemically modified or protein engineered mutants are included. Suitable cellulases include cellulases from the genera Bacillus, Pseudomonas, Humicola, Fusarium, Thielavia, Acremonium, e.g., the fungal cellulases produced from Humicola insolens, Myceliophthora thermophila and Fusarium oxysporum disclosed in US 4,435,307, US 5,648,263, US 5,691,178, US 5,776,757 and WO 89/09259. (Novozymes A/S), CLAZINASE®, and PURADAX HA® (Genencor International Inc.), and KAC-500(B)® (Kao Corporation). In one aspect, the cellulase can include microbial-derived endoglucanases exhibiting endo-beta-1,4-glucanase activity (E.C. 3.2.1.4), including a bacterial polypeptide endogenous to a member of the genus Bacillus which has a sequence of at least 90%, 94%, 97% and even 99% identity to the amino acid sequence SEQ ID NO:2 in US 7,141,403) and mixtures thereof. Preferably, the composition comprises a cleaning cellulase belonging to Glycosyl Hydrolase family 45 having a molecular weight of from 17kDa to 30 kDa, for example the endoglucanases sold under the tradename Biotouch® NCD, DCC and DCL (AB Enzymes, Darmstadt, Germany). (a) mutations at one or more of positions 9, 26, 149. 182, 186, 202, 257, 295, 299, 323, 339 and 345; and (b) optionally with one or more, preferably all of the substitutions and/or deletions in the following positions: 118, 183, 184, 195, 320 and 458, which if present preferably comprise R118K, D183*, G184*, N195F, R320K and/or R458K. Stainzyme®, Natalase, Termamyl®, Termamyl® Ultra, Liquezyme® SZ (all Novozymes, Bagsvaerd, Denmark) and Spezyme® AA or Ultraphlow (Genencor, Palo Alto, USA). Choline oxidase._Preferably, the composition comprises a choline oxidase enzyme such as the 59.1 kDa choline oxidase enzyme endogenous to Arthrobacter nicotianae, produced using the techniques disclosed in D. Ribitsch et al., Applied Microbiology and Biotechnology, Volume 81, Number 5, pp875-886, (2009). Other enzymes. Other suitable enzymes are peroxidases/oxidases, which include those of plant, bacterial or fungal origin. Chemically modified or protein engineered mutants are included. Examples of useful peroxidases include peroxidases from Coprinus, e.g., from C. cinereus, and variants thereof as those described in WO 93/24618, WO 95/10602, and WO 98/15257. Commercially available peroxidases include GUARDZYME® (Novozymes A/S). Other preferred enzymes include pectate lyases sold under the tradenames Pectawash®, Pectaway® and mannanases sold under the tradenames Mannaway® (all from Novozymes A/S, Bagsvaerd, Denmark), and Purabrite® (Genencor International Inc., Palo Alto, California). "identity". For purposes of the present invention, the alignment of two amino acid sequences is determined by using the Needle program from the EMBOSS package (http://emboss.org) version 2.8.0. The Needle program implements the global alignment algorithm described in Needleman, S. B. and Wunsch, C. D. (1970) J. Mol. Biol. 48, 443-453. The substitution matrix used is BLOSUM62, gap opening penalty is 10, and gap extension penalty is 0.5. Perfume microcapsule. Preferably, the composition comprises a perfume microcapsule. Preferred perfume microcapsules comprise melamine formaldehyde, urea formaldehyde, urea, or mixtures thereof. Starch encapsulated perfume accord. Preferably, the composition comprises a starch encapsulated perfume accord. Fabric softening agent. The composition may comprise a fabric-softening agent. Preferably, the fabric softening agent is selected from: clay, preferred clays are montmorilloniet clay; silicone, a preferred silicone is poly dimethyl siloxane (PDMS); quaternary ammonium fabric softening compounds; and mixtures thereof. A highly preferred fabric softening agent is a combination of clay, especially montmorillonite clay, with silicone, especially PDMS. The composition may also comprise a flocculating agent in combination with the fabric- softening agent. A preferred flocculating agent is polyethylene oxide (PEO). PEO is especially preferred when used in combination with clay, especially montmorillonite clay. Cationic polymer. The composition may comprise a cationic polymer. Preferred cationic polymers include: cationic silicones; cationic cellulose, especially cationic hydroxyethyl cellulose; cationic polyamines; and mixtures thereof. Alkoxylated polyamine. The composition may comprise an alkoxylated polyamine. Fabric -deposition aid. The composition may comprise fabric deposition aid. Suitable fabric-deposition aids are polysaccharides, preferably cellulosic polymers. Other suitable fabric- deposition aids include poly diallyl dimethyl ammonium halides (DADMAC), and co-polymers of DADMAC with vinyl pyrrolidone, acrylamides, imidazoles, imidazolinium halides, and mixtures thereof, in random or block configuration. Other suitable fabric-deposition aids include cationic guar gum, cationic cellulose such as cationic hydoxyethyl cellulose, cationic starch, cationic polyacylamides, and mixtures thereof. Cyclodextrins. The composition may comprise cyclodextrin. The cyclodextrin may be directly incorporated into the composition, or alternatively the cyclodextin may be formed in-situ with a cyclomaltodextrin glucotransferase (CGTase) and a substrate of starch or dextrin being incorporated into the composition. brighteners; hueing agents; photobleach; fabric-softening agents such as clay, silicone and/or quaternary ammonium compounds; flocculants such as polyethylene oxide; dye transfer inhibitors such as polyvinylpyrrolidone, poly 4-vinylpyridine N-oxide and/or co-polymer of vinylpyrrolidone and vinylimidazole; fabric integrity components such as oligomers produced by the condensation of imidazole and epichlorhydrin; soil dispersants and soil anti-redeposition aids such as alkoxylated polyamines and ethoxylated ethyleneimine polymers; anti-redeposition components such as polyesters and/or terephthalate polymers, polyethylene glycol including polyethylene glycol substituted with vinyl alcohol and/or vinyl acetate pendant groups; perfumes such as perfume microcapsules, polymer assisted perfume delivery systems including Schiff base perfume/polymer complexes, starch encapsulated perfume accords; soap rings; aesthetic particles including coloured noodles and/or needles; glycerol carbonate; dyes; fillers such as sodium sulphate, although it may be preferred for the composition to be substantially free of fillers; carbonate salt including sodium carbonate and/or sodium bicarbonate; silicate salt such as sodium silicate, including 1.6R and 2.0R sodium silicate, or sodium metasilicate; co-polyesters of di-carboxylic acids and diols; cellulosic polymers such as methyl cellulose, carboxymethyl cellulose, hydroxyethoxycellulose, or other alkyl or alkylalkoxy cellulose, and hydrophobically modified cellulose; carboxylic acid and/or salts thereof, including citric acid and/or sodium citrate; and any combination thereof. A method of laundering fabric. The method of laundering fabric typically comprises the step of contacting a solid laundry detergent composition to water to form a wash liquor, and laundering fabric in said wash liquor, wherein typically the wash liquor has a temperature of above 0°C to 20°C, preferably to 19 °C, or to 18 °C, or to 17 °C, or to 16°C,or to 15 °C, or to 14 °C, or to 13 °C, or to 12 °C, or to 11 °C, or to 10 °C, or to 9 °C, or to 8 °C, or to 7 °C, or to 6 °C, or even to 5°C. The fabric may be contacted to the water prior to, or after, or simultaneous with, contacting the laundry detergent composition with water. Typically, the wash liquor is formed by contacting the laundry detergent to water in such an amount so that the concentration of laundry detergent composition in the wash liquor is from above Og/1 to 5g/l, preferably from lg/1, and preferably to 4.5g/l, or to 4.0g/l, or to 3.5g/l, or to 3.0g/l, or to 2.5g/l, or even to 2.0g/l, or even to 1.5g/l. Highly preferably, the method of laundering fabric is carried out in a front-loading automatic washing machine. In this embodiment, the wash liquor formed and concentration of laundry detergent composition in the wash liquor is that of the main wash cycle. Any input of water during any optional rinsing step(s) that typically occurs when laundering fabric using a front- loading automatic washing machine is not included when determining the volume of the wash liquor. Of course, any suitable automatic washing machine may be used, although it is extremely highly preferred that a front-loading automatic washing machine is used. It is highly preferred for the wash liquor to comprise 40 litres or less of water, preferably 35 litres or less, preferably 30 litres or less, preferably 25 litres or less, preferably 20 litres or less, preferably 15 litres or less, preferably 12 litres or less, preferably 10 litres or less, preferably 8 litres or less, or even 6 litres or less of water. Preferably, the wash liquor comprises from above 0 to 15 litres, or from 1 litre, or from 2 litres, or from 3 litres, and preferably to 12 litres, or to 10 litres, or even to 8 litres of water. Most preferably, the wash liquor comprises from 1 litre, or from 2 litres, or from 3 litres, or from 4 litres, or even from 5 litres of water. Typically from 0.01kg to 2kg of fabric per litre of wash liquor is dosed into said wash liquor. Typically from 0.01kg, or from 0.02kg, or from 0.03kg, or from 0.05kg, or from 0.07kg, or from 0.10kg, or from 0.12kg, or from 0.15kg, or from 0.18kg, or from 0.20kg, or from 0.22kg, or from 0.25kg fabric per litre of wash liquor is dosed into said wash liquor. Preferably 50g or less, more preferably 45g or less, or 40g or less, or 35g or less, or 30g or less, or 25g or less, or 20g or less, or even 15g or less, or even lOg or less of laundry detergent composition is contacted to water to form the wash liquor. Preferably, the laundry detergent composition is contacted to from above 0 litres, preferably from above 1 litre, and preferably to 70 litres or less of water to form the wash liquor, or preferably to 40 litres or less of water, or preferably to 35 litres or less, or preferably to 30 litres or less, or preferably to 25 litres or less, or preferably to 20 litres or less, or preferably to 15 litres or less, or preferably to 12 litres or less, or preferably to 10 litres or less, or preferably to 8 litres or less, or even to 6 litres or less of water to form the wash liquor. Suitable solid laundry detergent compositions for use in the method are described in more detail above. Remarks. The dimensions and values disclosed herein are not to be understood as being strictly limited to the exact numerical values recited. Instead, unless otherwise specified, each such dimension is intended to mean both the recited value and a functionally equivalent range surrounding that value. For example, a dimension disclosed as "40 mm" is intended to mean "about 40 mm." (d) lipase having at least 60%, preferably at least 90% identity with Cefll. 2. Solid detergent composition according to any preceding claim, wherein the composition comprises perfume microcapsule. 3. Solid detergent composition according to any preceding claim, wherein the composition comprises cationic polymer. 4. Solid detergent composition according to any preceding claim, wherein the composition comprises clay and silicone. 5. Solid detergent composition according to any preceding claim, wherein the composition comprises a fabric-deposition aid. 6. Solid detergent composition according to any preceding claim, wherein the composition comprises alkoxylated polyamine. 7. Solid detergent composition according to any preceding claim, wherein the composition comprises bleach catalyst. 8. Solid detergent composition according to any preceding claim, wherein the composition comprises hueing agent. 9. Solid detergent composition according to any preceding claim, wherein the composition comprises mid-chain branched detersive surfactant. 10. Solid detergent composition according to any preceding claim, wherein the composition is a free flowing particulate form. 11. A method of laundering fabric comprising the step of contacting a solid laundry detergent composition according to any preceding claim to water to form a wash liquor, and laundering fabric in said wash liquor, wherein the laundry detergent is contacted to water in such an amount so that the concentration of the laundry detergent composition in the wash liquor is from above Og/1 to 5g/l, and wherein from 0.01kg to 2kg of fabric per litre of wash liquor is dosed into said wash liquor, and wherein preferably the water has a temperature of 20°C or less, more preferably less than 20°C. MX2015015606A (en) * 2013-05-14 2016-03-03 Novozymes As Detergent compositions.